It could make a huge difference in national health if Americans, across the board, upped their intake of magnesium. That conclusion is derived from a recent study out of China. "On December 8, 2016 BMC Medicine published the results of a meta-analysis conducted by researchers at Zhejiang University in China which concluded that consuming a higher amount of magnesium is associated with a lower risk of heart failure, stroke, type 2 diabetes and all-cause mortality during up to 30 years of follow-up. The meta-analysis is the first to investigate the effect of dietary magnesium intake on the risk of heart failure and the first quantitative meta-analysis to examine the dose-response relationship between dietary magnesium intake and all-cause mortality." "Our meta-analysis provides the most up-to-date evidence supporting a link between the role of magnesium in food and reducing the risk of disease," Dr Wang stated. "Our findings will be important for informing the public and policy makers on dietary guidelines to reduce magnesium deficiency related health risks." 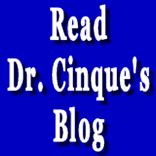 Dr. Cinque: Magnesium is the second most abundant mineral in the human body after calcium. Besides being a structural mineral like calcium (where magnesium is the second most abundant mineral in bones) magnesium is high enzymatic. There are over 400 bio-chemical reactions in the human body that are dependent on magnesium as a co-factor, and there may be more that aren’t known. It is obvious from this study that magnesium deficiency is extremely common, and correcting it would ameliorate chronic degenerative diseases across the board. How tragic it is that something so plentiful and so accessible and so inexpensive could make such a big difference! What are we waiting for? Magnesium occurs mainly in unrefined plant foods, particularly green vegetables, beans, nuts, seeds, and whole grains. Increasing these foods would be a very good idea. In fact, they are the foods that people should primarily be eating, with the addition of fruits. Everything else should be an afterthought. But, as the article states, getting up to, say, 400 mgs magnesium a day may be hard for many people to reach even when they try to eat healthily. And note that most multis contain very little magnesium- not a meaningful amount- because it’s just too bulky to squeeze into multis. So, what I do is keep a container of Mag Complete around which supplies 120 mgs magnesium per capsule. Its product number is CP1830. It contains several forms of very usable magnesium. And I take it at night before bed. The reason I do that is because magnesium is known to be relaxing- to the nerves and muscles. So, it can help with sleep. It doesn’t make you sleepy but it does help you relax so that you can fall asleep naturally. So, I take one before bed, and if I wake up during the night, I may take another. So, between that, and my natural foods diet, and the small amount of magnesium I get from my multi, I am sure I am getting plenty of magnesium. Really, it is an awful shame that people should be suffering and dying early because of a deficiency of magnesium. It’s a tragedy. It’s a matter of dying out of ignorance- and that may be not just patient ignorance but doctor ignorance. How many doctors are encouraging their patients to consume more magnesium to prevent diseases? So, make sure that you are getting enough magnesium. It is extremely safe. The worst thing that will happen if you take too much is that you may get some loose stools- as in milk of magnesia. That’s right; in high amounts, magnesium is also used as a laxative. I believe that irrational exuberance dominated the mindset of Americans that Modern Medicine was going to increase lifespans indefinitely. Life expectancy of Americans dipped slightly in 2015 compared with 2014, according to the latest data from the CDC. And keep in mind that the CDC is like the OPEC of drug companies, so it’s hardly unbiased. I’m not saying that they would ever skew statistics, but then again, yes I am. I know very well that they do. This is the same organization that says that 36,000 people die every year of the flu, just to bolster the sale of the ridiculous flu vaccine. In 2015, life expectancy at birth was 78.8 years for all Americans, a decrease of 0.1 year from 78.9 years in 2014, wrote Elizabeth Arias, PhD, and colleagues from the National Center for Health Statistics, a division of the CDC. For males, life expectancy at birth changed from 76.5 years in 2014 to 76.3 years in 2015, a decrease of 0.2 year, and for females, it decreased 0.1 year from 81.3 years in 2014 to 81.2 years in 2015. In 2015, life expectancy at age 65 years for the total population was 19.4 years, the same as in 2014. Life expectancy at age 65 was 20.6 years for women and 18.0 years for men, both unchanged from 2014. In 2015, the difference in life expectancy at age 65 between women and men held steady at 2.6 years. In 2015, a total of 2,712,630 resident deaths were registered in the United States — 86,212 more than in 2014. From 2014 to 2015, the age-adjusted death rate for the total population rose 1.2%, from 724.6 deaths per 100,000 in 2014 to 733.1 in 2015. "The rate for the total population rose significantly for the first time since 1999," the authors report. There was no change from 2014 to 2015 in the 10 top causes of death: heart disease, cancer, chronic lower respiratory tract diseases, unintentional injuries, stroke, Alzheimer's disease, diabetes, influenza and pneumonia, kidney disease, and suicide. Together they accounted for 74.2% of all deaths in the United States in 2015. However, from 2014 to 2015, age-adjusted death rates rose for 8 of 10 leading causes of death and decreased for 1. The rate increased 0.9% for heart disease, 2.7% for chronic lower respiratory tract diseases, 6.7% for unintentional injuries, 3.0% for stroke, 15.7% for Alzheimer's disease, 1.9% for diabetes, 1.5% for kidney disease, and 2.3% for suicide. The rate decreased by 1.7% for cancer. Age-adjusted death rates for influenza and pneumonia did not change significantly. Dr. Cinque: So, is just a fluke, or have we topped out in life expectancy in this country? I think it’s more likely the latter. And I don’t think there is anyone more cynical than I am about Medicine. Modern Medicine, in many instances, is contributing to the death rate not the survival rate. I believe the evidence shows that many of the pharmacological interventions are shortening lives rather than lengthening them. It's certainly true of scandalous drugs like Vioxx. And whether you agree with me or not, it is nevertheless true that many medical treatments aren’t even tested for the effect they are having on longevity. For instance, take high blood pressure drugs. Has it ever been scientifically tested whether the use of anti-hypertensive drugs is prolonging lives? No, it hasn’t. They have never done a double-blind study in which a Control group received placebo pills while the test group got treated. That, they say, would be unethical, and it’s the same excuse they give for not testing vaccines. But, there is some data available concerning the widely popular statin drugs, and the evidence is clear that they are NOT prolonging lives. Here is an article about it by Scottish physician and researcher Malcolm Kendrick. But, there are other reasons besides misguided medical practices that are causing longevity in America to stall. A major one is the rising rate of obesity, in both adults and children. Another is the rising rate of physical inactivity, in both adults and children. Smoking rates have supposedly come down to their lowest level ever, but I have to wonder how accurate the claims are. Tobacco companies seem to be doing well, and by my observations from being out in public, it seems like there are still plenty of people smoking. What say you? In any case, the expectation that Medicine was going to continue lengthening lives indefinitely seems to be a pipe dream. And if stem cell therapy is going to change that, it certainly hasn’t happened yet. The greatest potential of Modern Medicine to prolonging lives, in my opinion, is bio-identical hormone replacement. This is way off-topic, but I'm putting it up anyway, for the same reason that Bill Clinton gave us: "because I can." The JFK story is a lie, but we are bombarded with lies, including a lot of medical lies. And, one of those medical lies which they tell in order to support the booming kidney transplant industry is that it doesn't hurt to donate a kidney. It damn well hurts you. It hurts you a lot. It is a crime against yourself to do it. And now, refreshingly, here is an article written by a medical student who at the age of 18 was conned into donating a kidney but now, he regrets it. I'm putting the whole article up right here. But, Medicine has known all along that donating a kidney is extremely compromising. Consider that the most widely used measure of kidney function is the blood creatinine test. Normally it's at about 1mg/dl or less. And the lower the better. You donate a kidney, and it rises to nearly 2. Once it gets to 3, you're in early stage kidney failure. So, you're half-way there just from donating a kidney. And it makes sense. Normally, in life, your kidneys take turns working. Each as its own ureter draining into the bladder, but at any given time, 90% of the output is coming from just one kidney. Meanwhile, the other one is resting and repairing. But, obviously, if you donate a kidney, you're remaining kidney has to work 24/7/365 year after year after year until you die. It's like a hamster on a treadmill that never stops, and doing twice the work as before. So, read this refreshingly honest article that somehow slipped past the censors. ANY SURGEON WHO CUTS A HEALTHY KIDNEY OUT OF SOMEONE SHOULD BE PROSECUTED FOR MEDICAL MALPRACTICE AND INFLICTING SEVERE BODILY HARM. When I was 18, my stepfather’s brother had been on dialysis for just over a year. He was thin, he exercised regularly and he seemingly was in perfect health, but inexplicably his kidneys began to fail him. Although I was just about to leave for college, I’d heard enough about the misery of dialysis to decide to get tested as a possible donor. In the back of my mind, I knew that the chances of our compatibility were incredibly low because we were not related by blood. Perhaps that made it easy for me to decide to get tested. When we received the results, I was stunned to find out that he and I were a match. The transplant team gave me plenty of opportunities to back out of the donation, and it put me through countless evaluations, physical and psychological. Much of my family was steadfast against my becoming a donor. Looking back, who could blame them? Their son-grandson-nephew was going to undergo a major operation with no benefit to himself. However, I continued to be confident in my choice. I relied on the one fact that would be repeated to me many times: “The rate of kidney failure in kidney donors is the same as the general population.” Why wouldn’t everyone donate a kidney, I wondered. My mother was the only one to — reluctantly — support my decision. She accompanied me to San Francisco, where the surgery took place, and we settled in for the weeks that I would spend recovering. On the day of the surgery, anesthesia flowed into my arm and the world swiftly slipped away. Then, just as quickly, it seemed, I awoke, nauseated and confused. So much preparation for such a short nap. The anxiety I’d felt about the surgery was now gone — as was one of my kidneys. An uneventful recovery came and went. I returned to college and resumed a normal life. Likewise, my step-uncle did very well and is living a full and healthy life, as is my donated kidney. Five years after the surgery, when I was 23 and getting ready to go to medical school, I began working in a research lab that was looking at kidney donors who had gone on to develop kidney failure. For that research, I talked to more than 100 such donors. In some cases, the remaining kidneys failed; in others, the organ became injured or developed cancer. The more I learned, the more nervous I became about the logic of my decision at age 18 to donate. And then in 2014, a study looking at long-term risks for kidney donors found that they had a greater risk of developing end-stage renal disease. Another study that same year raised the possibility that they may face a heightened risk of dying of cardiovascular disease and all-cause mortality (although this point remains controversial). Other studies and surveys, though, suggest that the risk, while greater, is still fairly small. The truth is, it is hard to get good numbers about what happens to donors. Hospitals are required to follow them for only two years post-donation, which does not catch such long-term complications as chronic kidney disease, cardiovascular issues or psychiatric issues. There is no national registry for kidney donors or other large-scale means of tracking long-term outcomes. The result is that we know neither the denominator (the total number of kidney transplants that have occurred over the decades) nor the numerator (the number of donors who have gone into kidney failure). And what we do know is incomplete. Yet the need for donors remains great, as the number of Americans needing a kidney transplant has steadily increased — to more than 120,000 — while the number of transplants performed has remained relatively steady — at about 30,000 per year . Donors are lauded for their altruism and bravery for what is promoted as a benign procedure with low long-term risk. We are told about neither the reality of donation risks nor the scarcity of data that’s available. As a medical student and soon-to-be physician, I’ve come to better understand the imperfections in the idea of informed consent. We work with the data we have, and patients aren’t always told that it may not be that solid. At the time of my surgery, I thought the system was designed to protect me as a donor. Yet, now, more than eight years later, I am angry that I was never fully informed of the lack of research or the unknown long-term health implications for me. Being a kidney donor has become a part of my identity. Some people — particularly in medical school — have put me on a pedestal for my altruism and bravery. But often I find myself hiding the fact that I donated, which I’d like to think of as an act of modesty. The sad and difficult truth is this: Knowing what I know now, I regret donating in the first place. The term “side effects” is a euphemism for the adverse, toxic effects of medical drugs. And keep in mind that often the desired, sought-after effects are also toxic. For instance, acid-blockers work by poisoning the cells that produce stomach acid. Impairing the production of stomach acid is certainly a toxic effect in my book, since producing stomach acid is normal and healthy. But, the biggest problem with the popular understanding of “side effects” is that if they don’t manifest visibly and palpably that they don’t exist. It’s often assumed that if a medical drug is well tolerated in the act of taking it, if it doesn’t cause you pain or discomfort, that it must be safe. That is a delusion. Let’s say, for instance, that a drug is poisoning the cells in your bone marrow which produce blood cells. So, those cells are under attack, and they start producing abnormal, defective blood cells, whether red, white, or platelets, or a combination. Are you going to feel anything? Probably not and for a long time. There are no pain receptors in your bone marrow. And if your blood contains abnormal cells, that is a high number of them, you won’t necessarily feel anything right away either. Eventually, say if you become anemic from the toxic effect of a medical drug, you’ll start experiencing symptoms, such as fatigue, shortness of breath, lack of stamina, paleness, etc. But, by then, by the time symptoms appear, the condition will be advanced. The early and intermediate stages of the drug-induced pathology will probably entail no symptoms at all. It’s quite true that some people may tolerate a medical drug better than other people. And the converse is also true that some people may not tolerate a medical drug that most tolerate. Take, for instance, statin drugs. Statin drugs cause muscle breakdown which can lead to pain, which is very common. But, in some people, the muscle breakdown is so great that it overwhelms the kidneys with the breakdown products of muscle protein. And, the result is they go into kidney failure. Of course, not everybody goes into kidney failure from taking a statin, but, I think it’s fair to say that everybody heads in that direction from taking a statin. Statins increase the risk of kidney failure, diabetes, and cancer. And that’s in everybody. And that’s in exchange for what? A vanishingly small statistical reduction in heart disease risk? It’s so small that 100 people would have to take statins for 10 years in order for 1 of them to avoid 1 heart attack. The risk/reward ratio for those drugs is absolutely appalling. Antibiotics are another class of drug that work by poisoning. The whole idea of them is to poison: bacteria. And you hope that that can be done without poisoning you- very much. But, at least with antibiotics, it’s usually a temporary thing. You take them for a week, maybe 10 days; maybe even 2 weeks. But, it’s not a life sentence. However, there are many drugs that are meant to be a life sentence. They put you on blood pressure drugs with the expectation that it is a life sentence. They put you on diabetes drugs with the same expectation. When they put you on drugs for arthritis, they don’t expect you to ever stop taking them. It’s meant to be permanent. And even drugs that are supposed to be for temporary use often wind up being permanent or at least long-term. For instance, most sleeping pills say that you should only take them for 10 days. But, if people were only going to take them for 10 days, how could the drug company afford the expensive ads? They know very well that people go on Ambien or another sleep drug for years and years and years. That includes drugs that were only tested for 6 weeks, meaning that they tested the safety of the drug over just 6 weeks of use. So, there is no such thing as a “side effect.” There are only effects. And most drugs not only have toxic effects but work in their desired effect through poisoning something. The fact is that there are very few drugs in Medicine that anyone with sense should want to take. Almost always, there are alternatives to taking medical drugs. And oftentimes, just living with your condition, whatever it is, is superior to treating it with medical drugs. I kid you not. The time has come not only to reevaluate medical drugs, but to reevaluate our attitude towards medical drugs. They are, generally speaking, harmful and dangerous, and that is a fact.